The youngest members of our family are green in every sense of the word. These miniature plants in 6 cm pots are excellent for compact arrangements and mixed planting schemes. Planting our different varieties together makes for an even more interesting feature. That’s why our Babies are also supplied as a harmonious mixed pallet. Our Kids come in 9 cm pots. They are a little bit older, so they’re visibly larger than their younger siblings. The Kids are also available in a practical pack of six mixed types. They’re perfect for adding variety to planters – and variety is always good. Supplied in 12 cm pots, these are great all-rounders. No garden is too big and no balcony box is too small for these multitalented guys. 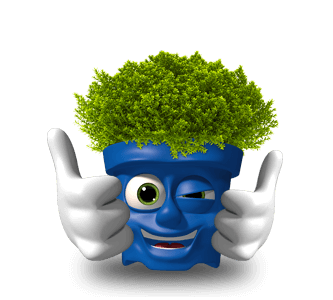 Greenboys® make a great addition to any scheme and can be combined with all sorts of flowering plants. These classic shrubs are supplied as a mixed pallet, a green globe (Bob) or in a CC container stocked with a harmonious blend of varieties. These strapping lads come in XXL 2 l containers and are much more mature. Above all, this means they are larger and taller. If you’re looking for a reliable way to fill a more sizeable gap in a border, call in the big guys.